Let’s be honest. Teaching can be exhausting. You have the responsibility to do lesson plans, attend professional development, communicate with parents, attend conferences, grade papers, collaborate with colleagues, deliver instruction, and the list. Goes. On. The saying, “ain’t no tired like teacher tired”, is definitely true. With everything on your plate as a teacher, it’s vital that you take care of yourself. You need to be at your best so you can deliver outstanding instruction to your students. Not only that, but you need at your best for your friends and family too. Your mental and spiritual well-being directly relate to how you perform as a teacher. 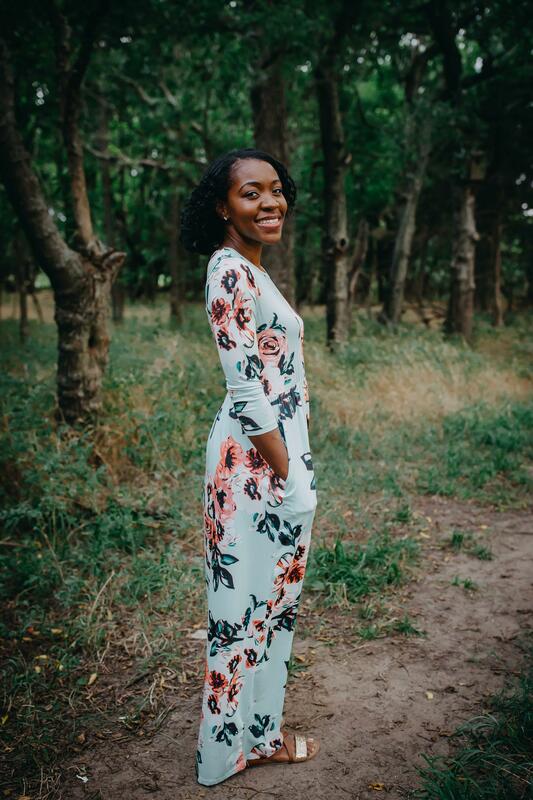 As an educator who is also a Christian, your relationship with God should be the foundation of everything you do in the classroom. Your daily habits also play into how you perform as a teacher. Developing healthy spiritual habits is one of the keys to achieving that spiritual and mental well-being. I’m sure you can tell when you haven’t been taking care of yourself by the way you feel and how you are interacting with your students, family, and friends. When you have those moments, I challenge you to take a step back and reflect on what habits you’ve been practicing. It could be negative self-talk, a lack of spending time with God or allowing your circumstances to dominate you. You must be conscious of what habits you are practicing each day. Replace those bad habits with good ones. So, what habits should you practice daily? 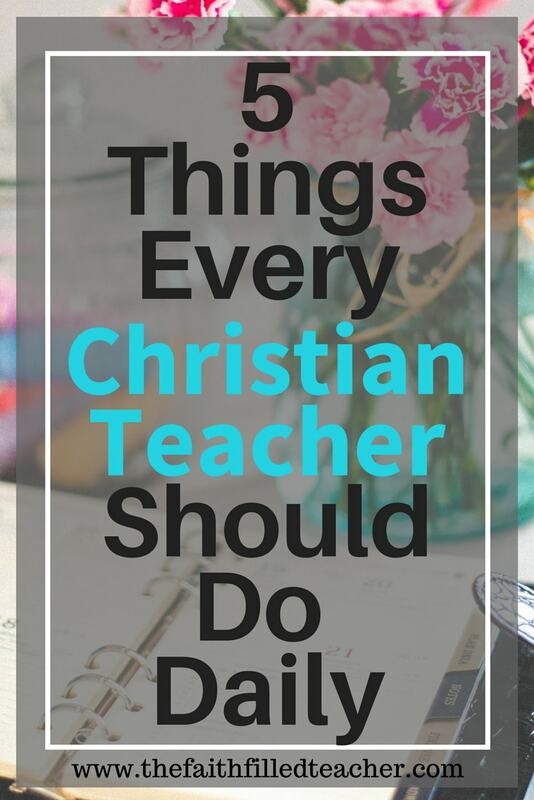 Keep reading to find out the five things every Christian teacher should do daily. Your spiritual food is your most important meal of the day. Just like our bodies need nourishment from natural food, our spirits and souls need nourishment from spiritual food. The Word of God says that man shall not live by bread alone, but by every word that proceedeth out of the mouth of God (Matt 4:4). We need to feed our spirits daily. In our minds is where our emotions and actions are rooted. So your thinking dictates your actions. If you think sad, depressing thoughts, you will feel sad and depressed and act that way. If you think positive and uplifting thoughts, you will feel and act that way. “I assure you and most solemnly say to you, unless you eat the flesh of the Son of Man and drink His blood [unless you believe in Me as Savior and believe in the saving power of My blood which will be shed for you], you do not have life in yourselves. 54 The one who eats My flesh and drinks My blood[believes in Me, accepts Me as Savior] has eternal life [that is, now possesses it], and I will raise him up [from the dead] on the last day.55 For My flesh is true [spiritual] food, and My blood is true [spiritual] drink. 56 He who eats My flesh and drinks My blood [believes in Me, accepts Me as Savior] remains in Me, and I [in the same way remain] in him.Jesus is the Living Bread, and those who believe in Him. The eating of the Bread means believing in Jesus and accepting Him as Savior. It also means following His ways, listening to His voice, and developing a close relationship with Him. So the Word of God is our lifeline. It’s our source. It’s what feeds us. Without spending time in the Word, we are spiritually weak. When we’re spiritually weak, we can’t fight the enemy. We can’t do the things the Word says like choosing not to be anxious and thinking on things that are good. We can’t love our neighbor (or our students) as ourselves. To be the best teacher and colleague you must keep yourself rooted and grounded in the Word of God. The Holy Spirit wants to help you in the classroom. He wants to give you the right method to use with your students, the right words to say to that troubled child, and brilliant instructional ideas. As a Christian in the classroom, you have extraordinary potential through the power of the Word of God. There are true advantages to being a Believer. You’d be silly not to take advantage of those benefits! Each day that you pour out life into your students. Refill yourself by refueling with the Word of God. Your prayer life should be persistent, devoted, and focused. With a focus on prayer, you can be in the best position to hear from the Holy Spirit throughout your day. A praying teacher is a force to be reckoned with. This one relates directly to prayer. Sometimes when we think of prayer, we only focus on the piece where we are talking to God. But prayer is all about communication, so you are speaking to God, but He also desires to speak to you. Spending time every day just being quiet gives you the opportunity to hear from God. 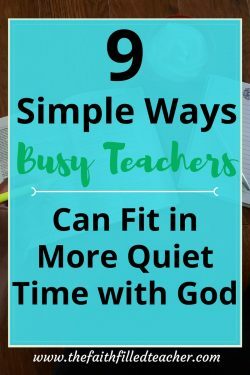 Quiet time allows you to drown out the noise of day to day life and just focus on the Creator. Quiet time is just good for the soul. There are so many distractions nowadays between social media, television, life in general, etc. It’s easy to allow the cares of this world and the distractions of this world to drown out God’s voice. It’s kind of like that sensation you get when you’re underwater. If someone is talking to you, you can hear them, but you definitely can’t make out what they’re saying. It’s not until you pull yourself out of the water and clear your ears that you can fully hear their message. God is the same way, He is always talking to us. But we’re not always listening. We’re head deep in the hustle and bustle of everyday life. 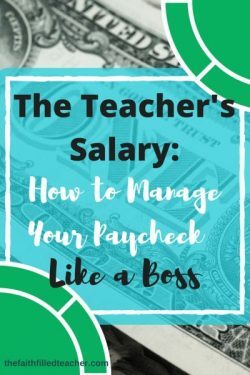 Dealing with our jobs, the demands of the school district, families, errands, and paying bills, just to name a few. God’s voice can easily become a muted muffle in the background of our lives if we’re not careful. So each day, get quiet with the Savior. The Word of God refers to our bodies as temples. 1 Corinthians 6: 19 says that we are not our own and that our bodies are temples of the Holy Spirit. Once we become followers of Christ, we need to crucify our flesh daily. We need to renew our minds and exchange our thoughts with God’s thoughts. Each day we need to aim to please Him in all we do. Taking care of your body is key. One of the things we can do to show diligence with our bodies is drinking water. Our bodies are made up of between 50-65% water. That is a whole lot of water. Water has some amazing benefits for our bodies. Drinking water helps to improve our skin, flush out toxins, lubricates joints, helps regulate body temperature, and aids in our overall health. I know it can be challenging to get your water in during the day while you are busy teaching. But it’s definitely one of those things we don’t want to neglect. Taking care of our temples should occur daily and regularly. So if you’re not drinking enough water, make a plan to get it in. Nehemiah 8:10 says, The joy of the Lord is my strength. As believers, we should possess true joy. True joy comes from having a perspective that is focused on Christ, and not on circumstances. Our circumstances can change from day to day, even moment to moment. When you are truly focused, rooted, and grounded in Christ, you are less likely to be shaken by day to day problems. I love the quote that says, “A Bible that is falling apart usually belongs to a person who is not.” This. Is. Truth. It’s really all about perspective. You can have two people going through the same situation and have one person filled with joy and hope, while the other is in despair. How can this happen? Well, because even though each of these people might be going through the same thing, their perspectives of the situation are completely different. It’s kind of like wearing those 3D glasses. If you look at the screen without the glasses on, your perspective of the movie is skewed. But look at that same screen with the 3D glasses on, and you can suddenly see things in a totally different light. When we view our lives and all the circumstances that can occur, we must view it with our spiritual 3D glasses on. As believers, we should have a positive, hope-filled perspective on life. When situations happen in your classroom or in your personal life, remember, it’s all about perspective. Choose to see the good. Choose to look beyond the circumstance and look to hills from which comes your help (Psalm 121:1). Know that you are God’s child and He has nothing but the best in mind for you. Thanks so for stopping by, stay for a while and check out some of my other blog posts. 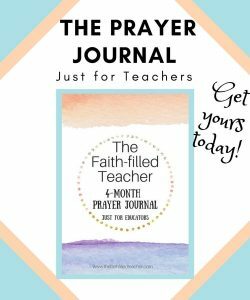 Don’t forget, if you aren’t signed up to get access to the Faith-filled Teacher FREE RESOURCE library, you can do it HERE.